I absolutely love making bread; there is something very therapeutic about kneading dough and patiently waiting for it to rise. Also it is amazing how those few ingredients (flour, water, yeast, and salt) transform into something fabulous. 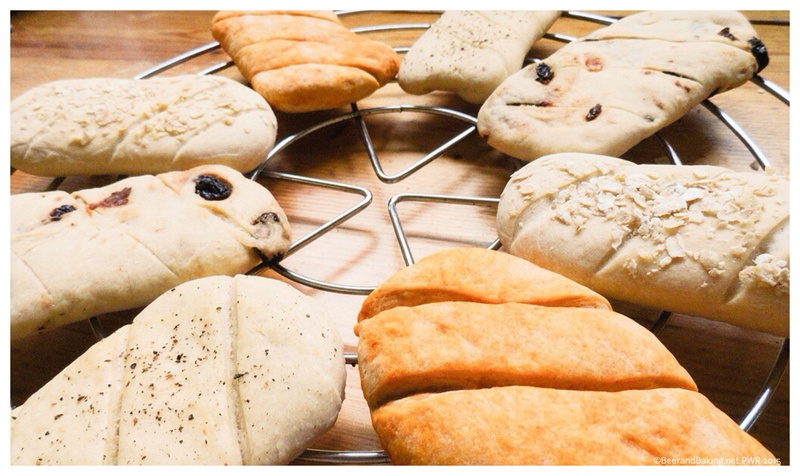 Once you have a dough it is so easy to add other ingredients to create a wide variety of different breads. I have made black pepper, oat, fruity, and tomato and parmesan panini rolls from the same dough to show how easy it is! These rolls are perfect for little sandwich rolls or slice in half and lightly toast for bruschetta. Or if you are like the Gorgeous One and I, as soon as they have cooled enough to eat but are still slightly warm slice in half and spread a good dollop of butter (or butter-like spread) and devour there and then. If freezing then put them in a plastic freezer bag as soon as they have cooled down as being fresh bread and with shallow depth they will go stale far quicker then their supermarket compatriots stuffed with preservatives. Although I made 8 rolls it was a bit of a stretch so I would advise making 6 from the recipe below. This recipe is taken from Gino D’Acampo’s Italian Home Baking. This was the recipe book that restarted my love of baking (see my guest post on The School Cook) and has lots of lovely Italian Breads, Biscuits and Cakes with very clear instructions. I have put a link at the bottom of the post to Amazon.co.uk but if you have a Works near you then have a look as I have seen it in there cheaper. As I had dried yeast instead of fast-action (due to the Gorgeous One placing a home delivery order instead of me going directly to the store) I needed to activate the yeast first. To do this mix a tsp of caster sugar with the 150ml of warm water – no hotter than 45oC otherwise will kill the yeast! Stir in the yeast and leave it to bubble for 15 minutes. Sieve the flour (I do this more from habit than necessity), add the salt and make a well in the centre. 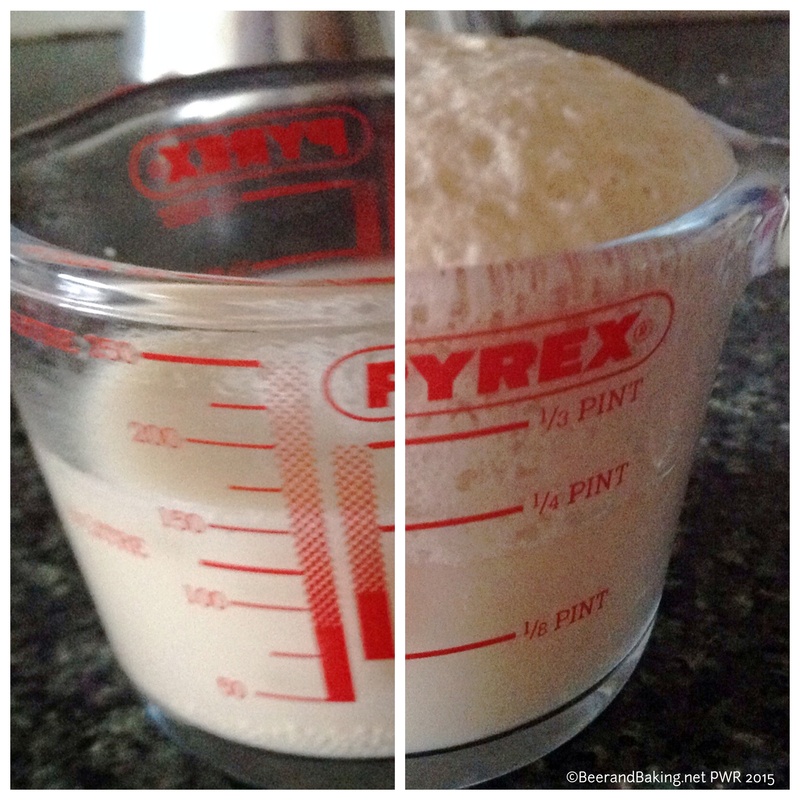 Pour in the yeast water mixture and bring together to form a dough. You can use a mixer with a dough hook but one of the things I love about bread and pastry is getting stuck straight in with my hands! Turn the dough out on a lightly floured surface and knead for about 10 minutes until you have a smooth and elastic dough. Kneading is all about stretching the dough to build gluten and if Paul Hollywood saw my technique he would probably have to sneak some of Mary Berry’s secret gin stash to calm down, but really it doesn’t matter how you knead just that you do it. Brush a bowl with olive oil and gather the dough into a ball and place into it. Brush the top with some more oil to stop a dry crust forming. The olive oil will also add to the flavour of the bread. Cover with clingfilm and put aside (away from draughts) for an hour to rise. Turn the dough out onto the floured surface and knock the air out of the dough by lightly punching. As I am showing the versatility of what you can do with bread I split my dough into 4 so I could add make the differences but if you are using only one method then keep the dough together. Gino’s recipe is for the black pepper paninis so I will go through this first. Knead the dough for a couple of minutes and split into balls. 6 balls if making all the same or if making a variety then 2. 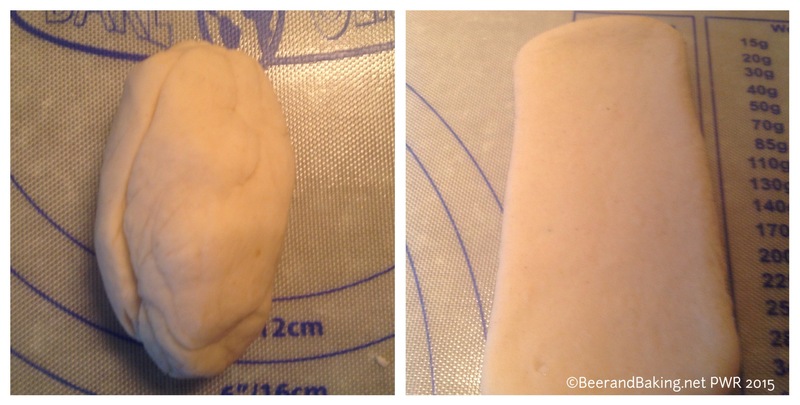 Quickly shape the ball into more of a sausage shape and then using a rolling pin roll out to 5cm by 10cm. One trick I found was to roll out 3/4 of the desired size and then fold the long edges back into the middle and fold over the top and bottom edges as this will help it become more rectangular than oval. Flip over and roll out to the correct size and transfer to a baking tray. Gino recommends a floured tray but I just use a tray lined with a sheet of baking paper. Brush with some more olive oil and grind some pepper over the rolls. 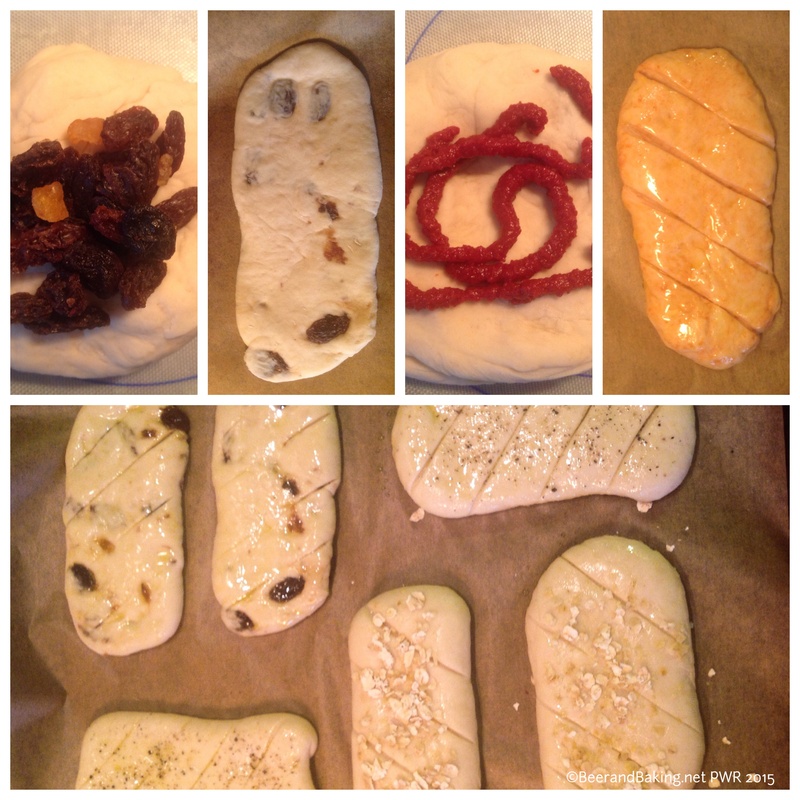 To make the fruity panini rolls I added roughly 2 tbsp of dried mixed fruit to a quarter of the dough and kneaded the fruit into the dough until it was evenly incorporated. Split the dough into balls and roll out as above for the black pepper rolls. To make the oat rolls substitute rolled oats for the black pepper. To make the tomato and parmesan rolls flatten the dough out and squeeze out a spiral of tomato puree. Grate a little parmesan cheese over the top and knead to incorporate. I am not going to lie this could be a little messy to start with but the tomato puree quickly becomes part of the dough. Split into balls and roll out as above. Using a sharp knife make 3-4 diagonal score lines. This helps guide the next rise and how it bakes in the oven. Cover the rolls with clingfilm and leave to rise for another 30 mins. After covering the rolls turn the oven on to preheat. Gino’s recipe says 200oC but I prefer a little cooler at 180oC. Bake the rolls for 20-25 minutes until the tops begin to colour a little. These rolls should go a light gold and not a deep brown. 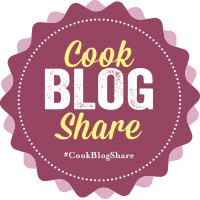 This entry was posted in Bread, Recipes and tagged bread, Dough, Dried Fruit, Gino D'Acampo, Home Baking, Oats, Panini, Parmesan, Pepper, Rolls, Tea Time Treats, TeaTimeTreats, Toast, Tomato. Bookmark the permalink. Looks like the cheesy ones are the firm favourite!